Halloween can be a stressful holiday for pet owners, with the doorbell sending most dogs into a tailspin as trick or treaters arrive en masse. In addition to the emotional distress that Halloween can cause, that bowl of candy by the front door is also treacherous for any pet. 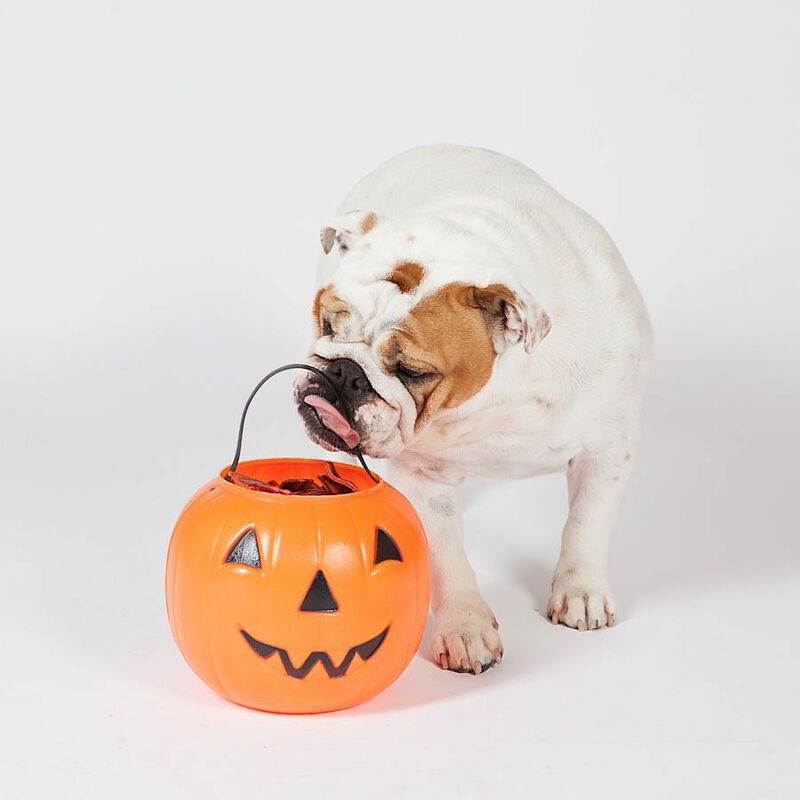 Keep your dog away from these tricks in the treat bucket this Halloween. Whether or not you have kids, chocolate is bound to make its way into your house this Halloween. Most dog owners are already aware of the dangers of chocolate for dogs, but here’s a quick refresher. The villain is a molecule found in chocolate known as theobromine, which is very difficult for dogs to digest. Not all chocolate is equally poisonous; dark chocolate contains more than six times the amount of the deadly molecule than milk chocolate, which means those Kit Kat Halloween Darkness candies are especially spooky. Smaller dogs are at a greater risk of getting sick than bigger breeds, and symptoms include vomiting, seizures, diarrhea, and increased heart rate. If ingested in large quantities, this sinister treat can lead to death, so keep that candy bowl far out of reach. Garlic is a key weapon in the fight against vampires, but it can also have adverse effects on your dog’s health. Garlic contains thiosulfate which damages red blood cells and can cause anemia. This can lead to jaundice and dark colored urine if your pup ingests it in large quantities, as well as diarrhea, stomach pain, and dehydration. So if you decide to hang garlic up around your haunted house, make sure it doesn’t get in your dog’s mouth. Unless, of course, your dog is actually a vampire. Trick or treaters can all unite over a shared disdain for that box of raisins in the treat bucket, and your dog is no different. Raisins and grapes are extremely toxic to your dog’s health and can lead to acute kidney failure. Some other common symptoms to look out for are diarrhea, lethargy and stomach pain. So if you’re trick or treating this year, skip the house with the bad candy; you’ll all be happier. Even non-chocolate candies can be toxic for your dog’s health due to an ingredient known as xylitol. This spooky, sugar-free sweetener can be found in lollipops, gum, Jello-O, and some brands of peanut butter. Xylitol can cause a dangerous insulin increase in dogs which can lead to a sharp decrease in blood sugar and cause hypoglycemia. Keep your dog safe this year by keeping that bag of treats out of reach. Instead of chocolate or candy, chop up some fresh treats for your dog to enjoy, like apples or carrots. They may not be as decadent as your treats, but your dog’s health is a far better investment. Someone needs to be around to keep you safe during those scary movies.